Physical / When should my baby start crawling? As your baby will most likely crawl or move around using other methods during these months, she’ll probably accomplish this after she learns how to sit up. Some babies can sit on their own, while others need a little support; don’t worry, eventually they all get there. When your daughter does, she’ll learn how to support her head to look around and her neck, back, arm, and leg muscles will be strong enough to support her when she’s on her hands and knees. Once she feels she can support her body, she’ll experiment with different kinds of movement that might involve shuffling, rolling, scooting, or slithering across the room. Regardless of her personal style, her first attempts at this may not lead to any forward movement. We’ve previously talked about how, at first, she might even find herself moving backward, instead of forward. 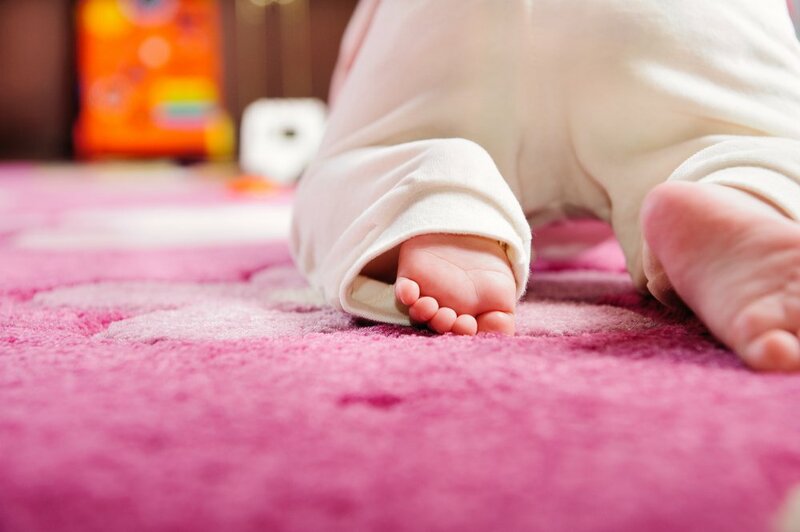 Remember crawling means something different to all babies, so while some might opt for a classic crawl, others might find that by pushing their arms to the floor they can scoot on their bottom to get somewhere. You might notice your baby beginning to move on her belly, rock back and forth, or even crawl across the room. Some kids even begin experimenting with pulling themselves to a standing position. Don’t worry, while it might seem like crawling is the next achievement in your little one’s timeline, actually the most important thing is that she feels motivated to explore her surroundings with any movement she feels comfortable with. Each month you’ll see she’s getting better at bearing more weight on her legs and overall muscles. It’s easy to see the physical milestones, but remember that during this time your little one will also be working on evolving her communication through sounds, facial expressions, gestures, and babbles. She’ll also get used to strangers, so she might experience some anxiety or fussiness when you are out of sight. Keep up the practice and be patient. The progress, rather than the timing, is what’s important. If you want to learn more about how to support your little one’s crawling skills continue reading: Tips to support my babies crawling skills.